Less than a month has passed after New Year’s eve and BitStarz Casino is already adding another memorable win to its hall of fame. After a pretty successful and publicized year of big wins, the casino is showcasing yet another lucky player this week who hit a Jackpot of over 12 Bitcoins in a game that most players have probably forgotten it existed – Amatic’s Book of Fortune. Get the scoop on the win and fresh details on the latest promo offers at BitStarz below. Bitcoin casinos have long been a safe haven for Russian players who have to deal with gambling restrictions in their country. Well, not only did BitStarz helped one lucky player enjoy some Bitcoin slot fun on the platform but they also helped the unidentified punter win 12.9 BTC, or $279,000 in USD at the time of winning. The Book of Fortune might not be the most visually appealing of games but it certainly proved that looks can be deceiving. 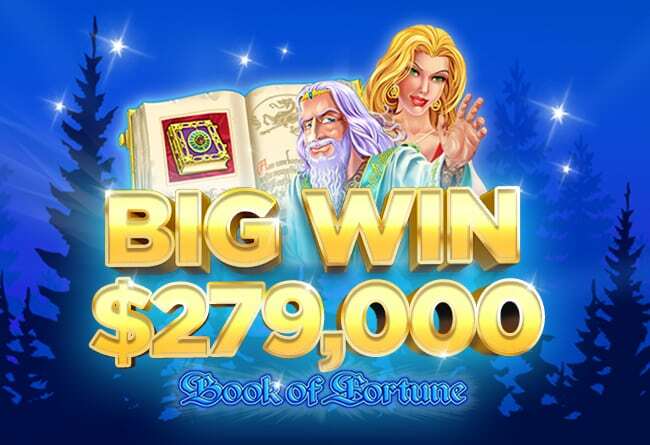 Featuring outdated animations and sound samples as well as an old-school mechanism that asks you to “collect” each win you make, Book of Fortune is one of those games that take you back to the early days of virtual slot machines. However, despite its retro feel, it comes with an interesting set of modern extras, including Expanding Wilds, Scatters, and a Free Spins round that can be re-triggered. Being a highly volatile slot, the game challenged a lucky Russian player who managed to work the slot in a way that “few have done before”, according to the casino. Likely triggering multiple bonus features and a confirmed 1,000x multiplier, the fortunate player was able to scoop the impressive jackpot, ensuring a great start to the new year. Marketing manager of the casino, Srdjan Kapor, commented on the win by saying that they are proud to be hosting the best of Amatic games, the Book of Fortune “certainly being one of the biggest” the casino offers. Back in October, it was another Amatic slot game – the Diamond Cats – that brought a BitStarz player a similarly impressive jackpot of 10 BTC. Join the Wars for Wager-Free Prizes! If you want to try your luck on Amatic’s slots, you’ll be happy to hear that the casino also offers other ways to get rewarded for enjoying slots, in case you don’t hit any jackpots on your own. Namely, each week the casino offers the Slot Wars tournament where punters get a chance to compete against each other by playing various games and win a share of a prize pool with €1,000 in cash prizes and 250 Free Spins. To compete in the races, all you have to do is play between Saturday and Sunday and watch your progress on the official tournament leaderboard. And even if you feel like switching things up and playing Baccarat, Blackjack, or Poker instead, the casino will still give you a shot at winning some tournament prizes with its weekly Table Wars tournament where the first prize is €500 in cash in BTC equivalent. And the best of all is that all tournament prizes offer wager-free rewards, including the slot competitions. If you like to check out the tournaments or try Amatic’s lucky slot game, you can use this link to check out BitStarz Casino.